SANTIAGO (3-4 overall, 0-2 Big VIII League) is a loss away from playing itself out of the playoffs so this game means everything for the Sharks, who have already lost to both Centennial and Norco to start league play. The offense was almost good enough to keep them in the game vs. Norco until the fourth quarter, but the defense couldn’t keep up with an elite back fresh into the game. So now they’ve dug themselves a deep hole only they can climb out from. Can they win tonight to keep their diming playoff hopes alive? Can Nate Castillo have one dominant performance in a big game this season? 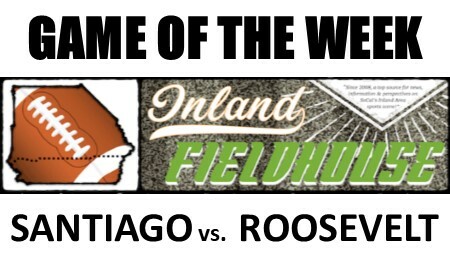 ROOSEVELT (5-2 overall, 2-0 Big VIII League) has had the opposite start to Santiago’s in league and looks like the team with the advantage because of it, but the Mustangs made a change at quarterback last week in a 43-17 win vs. Riverside King. Junior Kenzel Lawler had his most passing attempts since Week 1, replacing sophomore Xavier Ward who provided a glimpse of the future and played so well against a few big-time nonleague opponents. Who will be under center tonight could mean the difference between a win and a loss. Santiago’s experience. The Sharks have seen the best and now it should pay off.